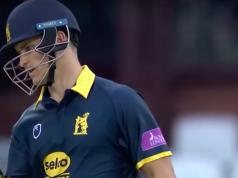 Mark Stoneman scored a century as Durham made steps towards closing the huge deficit set by Yorkshire on the third day’s play at the Emirates ICG. The Durham opener led his side to 244/4 at the close of play, which reduced Yorkshire’s lead to 105 and gave the home side every chance of forcing their opponents to bat again tomorrow. Ryan Pringle and Scott Borthwick had earlier made half centuries, but the league leaders were forced to follow on after Tim Bresnan and Jack Brooks made light work of Durham’s tail end, finishing with two wickets apiece. Adil Rashid grabbed two wickets in the second innings to dismiss Keaton Jennings and Paul Collingwood as Durham looked to put up more of a fight on a glorious day at Chester-le-Street. Pringle and Borthwick resumed at the crease this morning with the score 140/6, and quickly brought up the150 with Borthwick passing the half-century mark soon after. Both players came under heavy pressure from the Yorkshire attack before the Durham number three was caught behind from Bresnan to depart for 54, ending a partnership of 88. John Hastings fell to the same combination the very next ball, and the home side struggled to get going from there. Jamie Harrison survived the hat-trick ball, but barely made double figures before seeing his stumps tumbled by Brooks. At the other end, Pringle was offering some resistance, passing his second fifty of the summer. Having failed to make a first innings score of 200 in each of their previous four County Championship matches, Durham were still five runs short of a batting point when Chris Rushworth became Brooks’ second wicket of the morning. Only Pringle, who was left stranded on a career-best 69, could help his side limp to 208 all out. Following on and still 349 runs behind, the Durham openers began their second innings in a far more confident fashion. Stoneman’s half century helped his side reach their first 100-run opening stand of the season, before Rashid had Jennings caught at silly mid off for 41. The wickets of Borthwick and Collingwood either side of tea ensured the momentum was firmly with Yorkshire. Stoneman’s resilience formed the backbone of Durham’s fightback, and the 28-year-old reached his second century of the season with the side just 154 runs short of Yorkshire with seven wickets still in hand. There was still time for Brooks to get his third wicket of the day when Michael Richardson edged behind, but Stoneman and Gordon Muchall stayed strong in the final half hour of the day to leave Durham with a fighting chance of saving an unlikely draw.